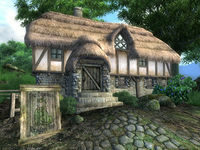 The Drunken Dragon Inn is an inn east of the Yellow Road, northeast of Leyawiin (quest-related). The publican, Andreas Draconis, buys potions and food while only selling the latter. The ground floor contains the reception area consisting of a counter and a dining room. On a lower level is a small room which serves as storage and contains large amounts of food and drink while the rooms are upstairs. The room that you can rent is the last on the right. It is well-lit, and contains a writing desk, a chest of drawers, and a middle-class single bed. Both of the other two rooms are locked and contain a single bed, which you are free to sleep in, as entering does not count as trespassing. Esta página foi modificada pela última vez à(s) 20h42min de 20 de março de 2014.